1 of 3 Combine pudding mix and milk in a bowl. Beat with a hand mixer for 2 minutes, or until soft set. 2 of 3 Crumble one shortbread cookie into the bottom of one jar. Top with 1/4 cup pudding, some sliced peaches and some blueberries. 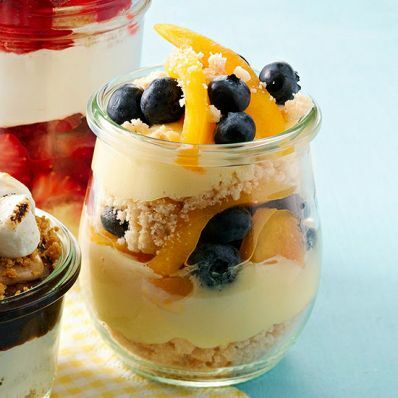 3 of 3 Repeat layering with a second crumbled cookie, 2 tbsp pudding and more fruit. Top with 2 tbsp pudding and garnish with more fruit. Repeat with 3 remaining jars. Refrigerate until serving.